A wedding reception in the East Bay last weekend quickly turned into a war zone when a massive brawl broke out and left at least two people critically injured. Police in Fremont responded Saturday night to the scene where a small fight on the dance floor grew into a violent brawl involving as many as 70 people in the parking lot of the Royal Palace. Two people were taken to the hospital with critical injuries, and one remained in critical condition Wednesday night. 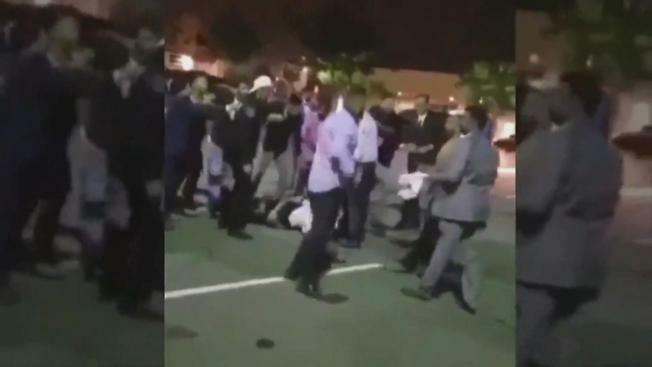 Cellphone video of the brawl has surfaced on social media. It shows a chaotic scene, with several people kicking and throwing punches. Some guests are yelling and appear to be trying to break up the fight, and others are seen huddled around a man lying on the pavement. A wedding reception in the East Bay last weekend quickly turned into a war zone when a massive brawl broke out and left at least two people critically injured. Michelle Roberts reports. "When people heard the sirens, they just ran here and there," said Raja Singh, a wedding photographer hired by the bride and groom. Singh said just before midnight, he noticed some wedding guests starting to argue on the dance floor and then running outside to the parking lot of the banquet hall. "Someone is beating someone on that side. Someone is beating someone else on that side. It was a big fight," he said. Singh said he watched the fight from a distance, but on Wednesday, he took a closer look at the cellphone video posted on Instagram. He wasn't sure who threw the first punch, but wedding guests told him the argument was a family dispute. One of the suspects in the brawl was scheduled to be arraigned in a Fremont courtroom Wednesday. Police said Armritpal Singh, from Missouri, faces a felony aggravated battery charge. Raja Singh said he’s hoping the victim makes a full recovery. "The doctors don't know what's going to happen," he said. "It's pretty serious." Police arrested and released a second suspect. The incident is still under investigation.